Human rights group Amnesty International has released a scathing assessment of China's human rights record since it was awarded the right to host next month's Olympic Games seven years ago. The report says that far from improving, China's human rights record has actually worsened. Amnesty says when it won the right to host the games, the Chinese Government promised better human rights and greater freedom for the media. But Amnesty's China researcher Mark Allison says this has not happened. "We want China to live up to its promise of complete media freedom and allow full access to foreign journalists who are reporting in China," he said. "We want them to release all the journalists, Chinese journalists, who've been imprisoned in violation of their human rights and also to stop its censorship of the domestic media, particularly the internet." There has not been a reaction to the Amnesty report from China so far. Beijing 2008: how much will you be allowed to see? Ye Guozhu was tried in secret and sentenced to four years in jail for “picking quarrels and stirring up trouble”. His ‘crime’ was to apply for permission to protest after his home and restaurant were demolished to make way for the Olympics. People like Ye Guozhu are silenced. You are not. Use your freedom to speak up for those who can’t and become a Human Rights Defender. Human rights in China have actually deteriorated because of the Games. The authorities have locked up and forcibly removed people they think will threaten the image of stability and harmony. 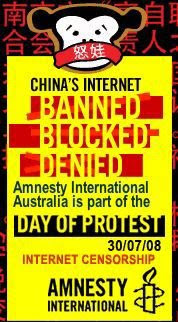 Help monitor China's internet censorship now! China operates a sophisticated internet censorship regime and it is difficult to know exactly what information Chinese citizens can and can't access. The lead-up to the 2008 Beijing Olympics has seen some previously inaccessible websites in China become wholly or partly accessible. We have developed a method to test, monitor and report on changes in levels of censorship, to assist in pressuring the Chinese Government to not revert old ways once the Games are over. If you are travelling to China during 2008 you can register to become a Chinese Internet Censorship Index (CICI) tester. This simply involves testing access to specific websites. The sites chosen for testing are ones that a tourist or journalist might access, such as BBC news and flickr. We believe that participating in these tests presents no risk to visitors to China. Those not travelling to China can also participate by displaying a CICI badge on their Facebook, MySpace, blog or website to help us spread the word. To mark the 10-day countdown to the Beijing Olympics on 30 July, we will be holding a global, online day of protest against internet censorship in China. All registered websites will display a censorship simulation which will momentarily censor random words on webpages. China will censor the Internet used by foreign media during the Olympics, an organising committee official confirmed Wednesday, reversing a pledge to offer complete media freedom at the games. "During the Olympic Games we will provide sufficient access to the Internet for reporters," said Sun Weide, spokesman for the organising committee. He confirmed, however, that journalists would not be able to access information or websites connected to the Falungong spiritual movement which is banned in China. Other sites were also unavailable to journalists, he said, without specifying which ones. Journalists working at the main press centre for the Olympics also complained that they were unable to access Internet sites belonging to rights group Amnesty International, the BBC, Germany's Deutsche Welle, Hong Kong newspaper Apple Daily, and Taiwan newspaper Liberty Times. "Our promise was that journalists would be able to use the Internet for their work during the Olympic Games," said Sun. "So we have given them sufficient access to do that." However, in the runup to the Games the Beijing Olympic organising committee, under pressure from the International Olympic Committee, has promised full access to the Internet for thousands of reporters expected here to cover the August 8-24 Games. Falungong is a spiritual group banned by China as an "evil cult," and many of its members have been detained, amid claims that hundreds have died in custody due to torture, abuse and neglect. The president of the NSW Tibetan Community, Tenzin Gaden said he hoped the Dalai Lama's visit would raise awareness of the plight of the Tibetan people, who are under Chinese rule. "Among all the communities, including the Chinese and Tibetan, those who live in Australia, I personally have had to deal with them in many, many years, they are strongly supportive of peace and harmony, because we are a great multicultural nation here."